↑ "Prakash Raj Openheart with RK ABN Andhrajyothy". YouTube. 6 November 2011. Retrieved 6 December 2013. 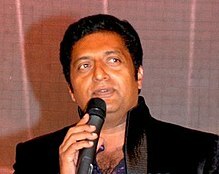 ↑ "I stopped taking life for granted after my son's death: Prakash Raj". The Times of India. 10 July 2013. Retrieved 6 December 2013.